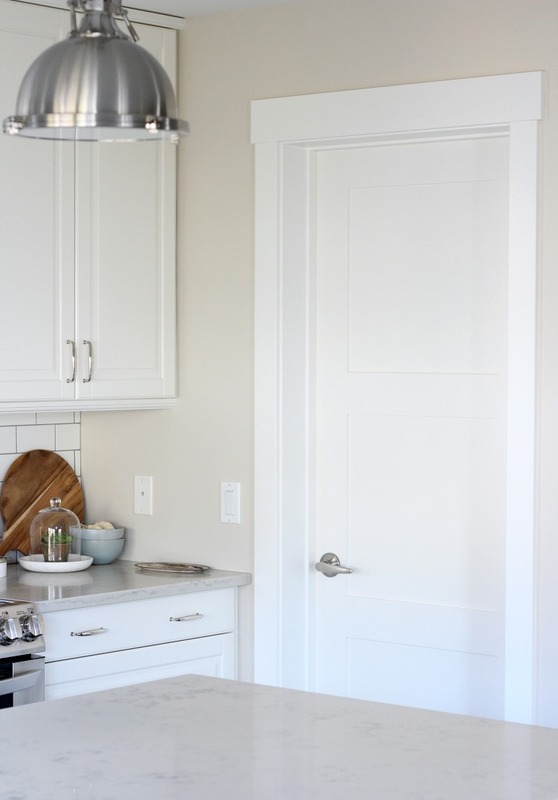 Benjamin Moore White Dove is a beautiful soft white paint colour with a hint of grey making it a popular choice for trim, cabinets, walls and more. One of the questions I’ve been getting a lot lately is the paint colour we used for our trim and doors (and fireplace) on our main floor. After testing several whites alongside our new kitchen cabinets, hardwood floors and wall colour, we ending up going with Benjamin Moore White Dove (OC-17). Although I tend to be uncertain about a new paint colour until I see it in a space, White Dove became an instant favourite. As soon as it started going up, I could tell it had just the right amount of soft warmth (not too creamy) to make it inviting, but also enough crispness to keep our rooms looking fresh. It felt like the perfect balance. Blends well with the marble subway tile surround on our fireplace, doesn’t it? Because we installed IKEA Bodbyn cabinet doors and drawer fronts in the kitchen, which are quite off-white (a little too yellow for me in certain lighting), I was looking for a trim paint colour that helped off-set the warm undertone. Colour matching the cabinets would’ve meant the trim throughout our home being too creamy, so that wasn’t an option. I tested quite a few whites (which I’ll get to), but found White Dove to be the best choice considering all of the factors we were dealing with. 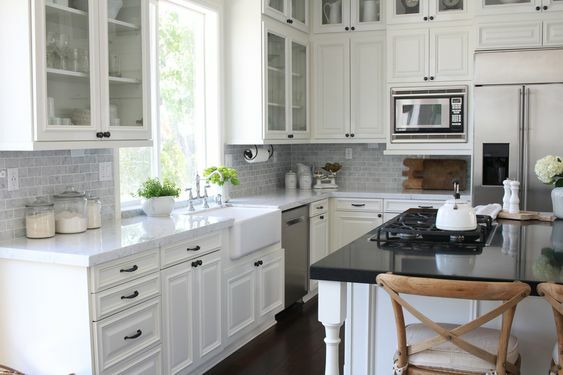 Side-by-side, the kitchen cabinets don’t look too creamy, yet the trim still looks fresh. A win! 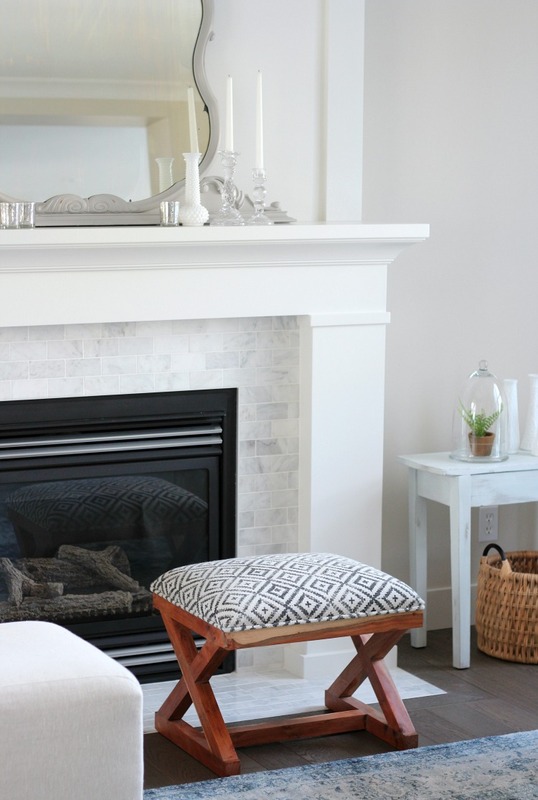 White Dove also pairs beautifully with our Baby Fawn wall colour (a soft griege by Benjamin Moore OC-15). 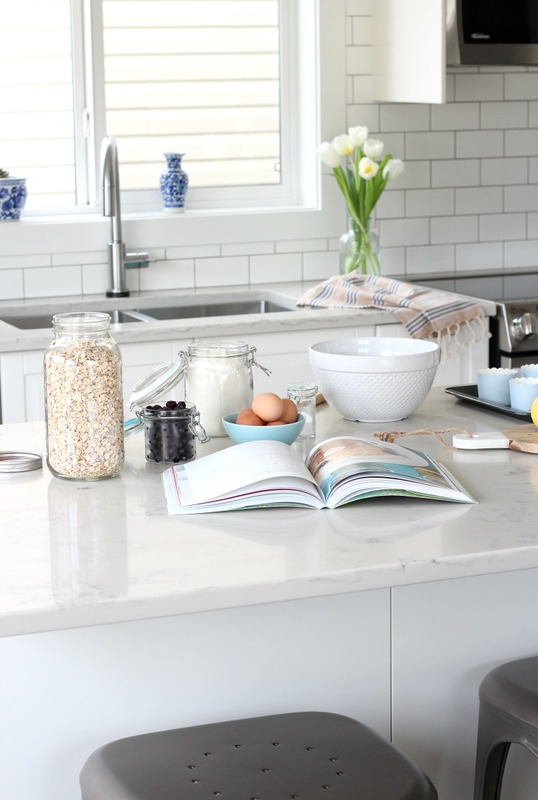 In addition, White Dove goes well with our subway tile backsplash, quartz countertops and white windows. It was tricky to find just the right white paint to tie everything together! Aside from the trim, doors and fireplace, we also ended up painting the walls in our pantry, laundry room, powder room and staircase (including the risers) in BM White Dove. We also used it on the ceiling once the popcorn was removed. You can see more of those rooms here. White Dove paint on the ceiling gave our rooms a lovely glow. Such a versatile paint colour! 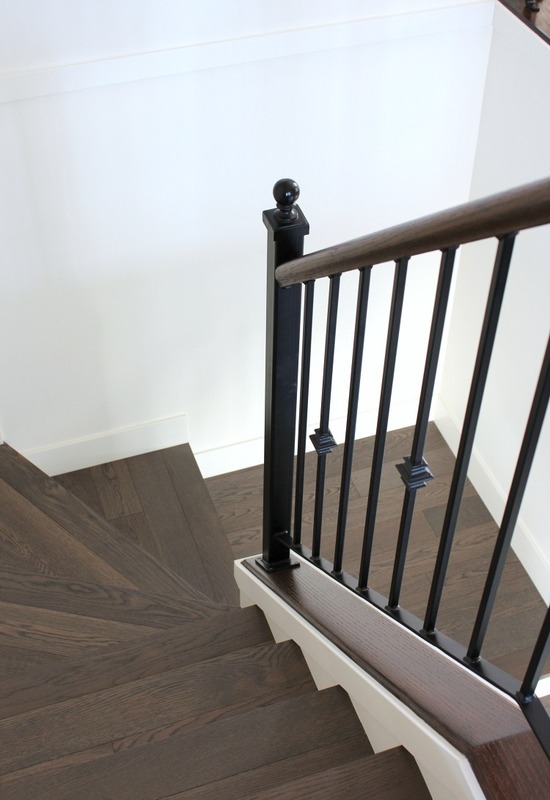 I think it pairs beautifully with our grey slate tile and dark(ish) white oak floors too. I’m loving our Benjamin Moore White Dove walls. What do you think? 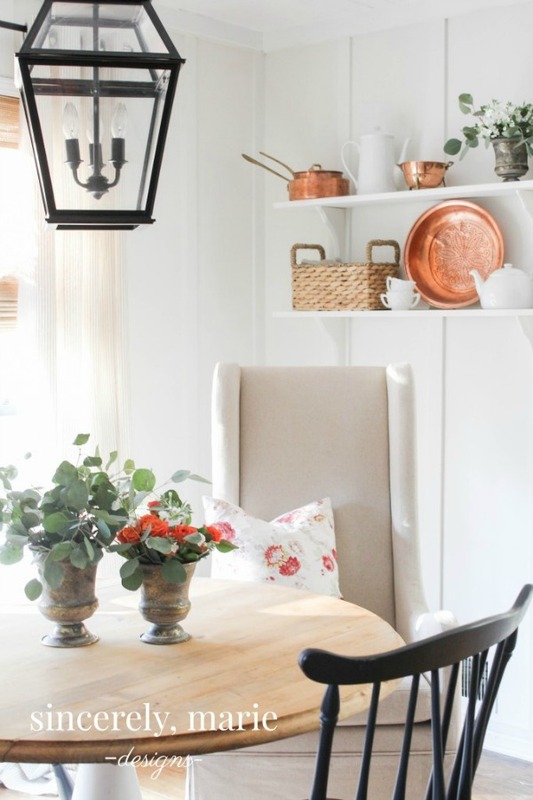 I love how the spaces look light and airy without being too stark no matter the time of day or the season we’re in. I spend a lot of time at home, so that’s very important! So how does White Dove stack up against the recently popular Simply White (OC-117)? It’s definitely darker and has more grey in it. Painted side-by-side, there’s a noticeable difference (I tested it out). 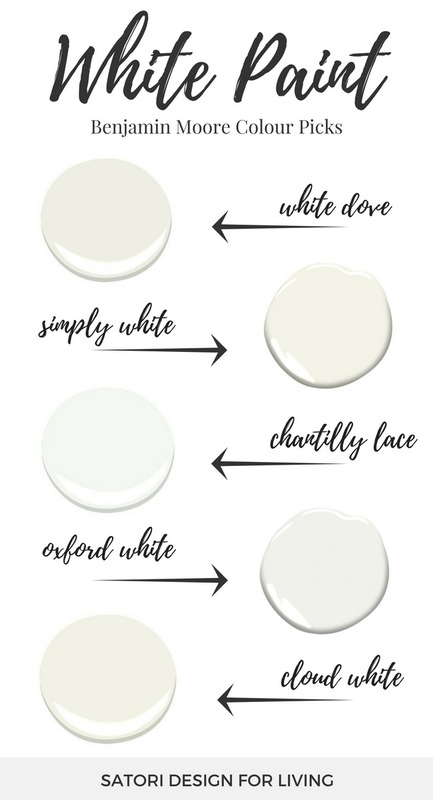 Other Benjamin Moore whites I considered and suggest taking a look at are Chantilly Lace (OC-65) and Oxford White (CC-30), which are both on the cooler, brighter side. I would consider them to be truer whites. Like a white that’s more subtle and warm? Check out Cloud White (OC-130). All of these white paint colours are beautiful in their own right depending on the look you’re going for. Compare samples (available at your Benjamin Moore store) side by side, i.e. Simply White vs. White Dove before you make a decision. What kind of natural light do you have in the room? White Dove can handle warm light with its slightly grey undertone but may not be the best choice for a north-facing, darker room. Keep in mind it will shift in colour from space to space. We live in “Sunny Alberta” which means White Dove reads more crisp with all of the natural light. Have grey/dull skies most of the time? Go for a brighter white colour. What colour are your kitchen appliances? 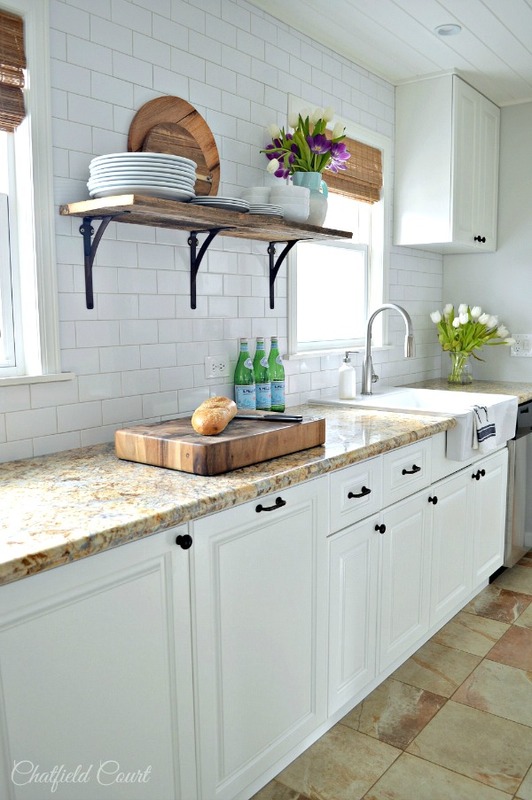 White Dove doesn’t tend to pair well with white kitchen appliances since they tend to be a brighter white. However, it works beautifully alongside stainless steel. What colours do you plan on adding to the room? 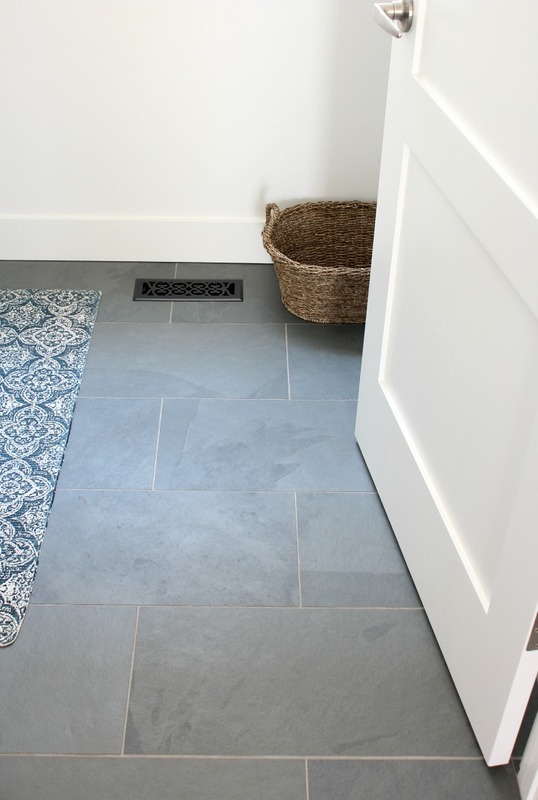 I tend to decorate using cooler tones (blues, greens, greys) which pair nicely with White Dove. Having said that, I’ve used red at Christmas and it looks equally as good. I’d say it goes well with most colours. Love it with natural linen fabric! What colour are your floors? Installing wallpaper? Light bounces off other surfaces often changing the colour of walls slightly. A friend once painted her room white in the winter and had a green room come spring once the trees leaved out. Be mindful of that if you have large windows! What colour is your ceiling? If your ceiling is stark white, you’ll want paint it the same colour as your trim in a flat finish or the room could look disjointed. Or, go with a completely different colour for your ceiling, such as a soft blue. Want an all-white room? For most spaces, select a flat finish for the ceiling, eggshell for the walls and a bit higher sheen (pearl or semi-gloss) for the trim. What paint finish are you using? More sheen equals more reflection making a colour appear lighter and brighter. Most paint chips are an eggshell finish, so keep that in mind while making your selection. 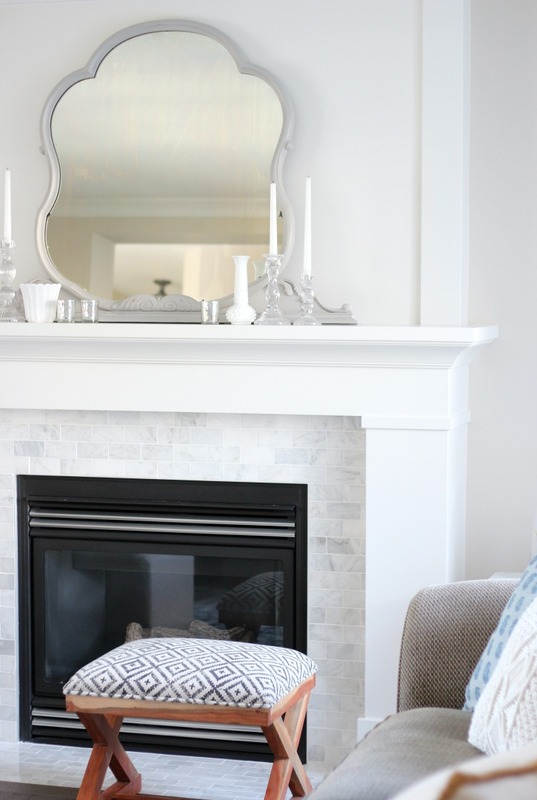 Looking for Benjamin Moore wall colours that look lovely alongside White Dove trim? Hale Navy, Revere Pewter, Classic Gray and Kendall Charcoal are some of my favourites. Please pin these beautiful inspiration photos from the original source. All so pretty, don’t you think? As you can see, Benjamin Moore White Dove paint reads very differently in each room, which means you should always test the colour first. I suggest reading these paint colour selection tips to help you through the process. 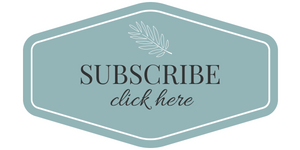 Want more decorating ideas and paint colour suggestions like these sent right to your inbox? What a color combination, Shauna! Actually, white paint color looks beautiful. 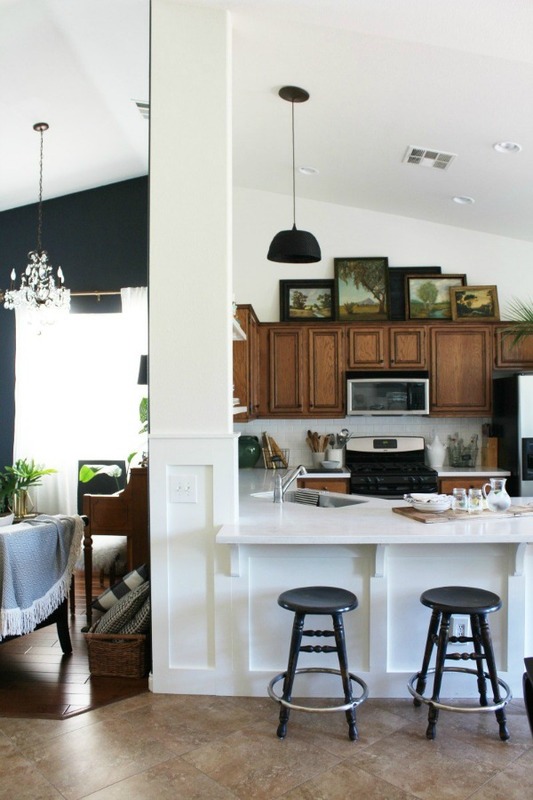 Definitely, I will apply your color combination in my kitchen makeover. Have a blessed day Shauna! Great article. We’re big fans of White Dove. We did our walls and ceiling in eggshell and it turned out great. It’s so quick and easy when one doesn’t need to cut in the ceiling although that’s not the reason we did it. White Dove in eggshell has just enough sheen. With two coats, the walls literally have a beautiful glow. For some reason, in one house it showed slightly yellow. We’ve done several where it had zero yellow characteristics, so not sure what that was about. So beautiful. What is the wall color in the kitchen? Thank you! Hi Gia, Thank you! The colour is Baby Fawn by Benjamin Moore. You can see more in this post. Hi Natalie, I suggest getting samples of a few different whites (in the sheen you’re planning on using) to test on your exterior before committing. White Dove may work, but I also suggest checking out Simply White, White Heron and Cloud White. Stand back and take a look at different times of the day in various intensities of light. It also depends on the colours that will be reflected i.e. neighbour’s house colour, trees, etc. I have Cloud White cabinets and they are creamier than I thought so now I need a quartz that will look good and a wall and trim Color!! Having a hard time!! Please help with some ideas!! I appreciate your help!! Hi Maureen, Our IKEA cabinets are off-white, too. Have you checked out the quartz we used? Get the details in this post. The exterior color of my house is white dove. What is a good color trim that goes with it, can you name a few please? Wow!! Thank you so much for including my little kitchen. Love how you have used this color in your home. Just gorgeous!! Thank you, Katie! It was our painter who wanted to colour match in Sherwin Williams lacquer for our trim and fireplace only. I think it’s the paint he’s used to spraying, so wanted to stick with it. I used Benjamin Moore for the trim that I painted with a brush and small roller in other our rooms. It looks like the same colour (see our powder room here). Sometimes it’s the finish that makes it seem duller or brighter. The SW isn’t overly shiny like some lacquers are. I love the pictures of your home! I fell in love with White Dove in a bright condo. It was also great in a bathroom with no windows. I am now remodeling condo. We face south, but no direct sunlight due to huge covered patio. I’ve been living with very gold walls, gold carpet, oak kitchen; and I want to paint walls, trim, ceiling and new interior doors all Dove White in different sheens. Recommendations for sheens? The kitchen cabinets will also be white-thermofoil–cabinet standard color. I am keeping creamy leather sofa and 2 chairs and much of furniture is wood/pine/rustic “cottage” look. Do you feel I need a different “color” or off white on walls? The idea of adding another color worries me. I want it warm, but bright. We have many cloudy days. Can you tell me the name of the grey tile you used? Hi Jane, It’s a polished marble subway tile we picked up at Home Depot. I believe it’s discontinued, but you can see more in this post. Thank you for responding – appreciate it. Sorry I wasn’t clear before, I meant to inquire about the Brazilian slate tile floor you used on the floor. Oh, I see! Here’s the grey slate we used. We just bought a 1200 square foot lake house. Most of the walls in the main space are a honey coloured pine including the kitchen cabinets. Big picture windows facing a lake. We are not painting the wood this year…it’s kind of rustic. We will paint the ceiling, trim, doors, bedroom walls and bathroom. We want to brighten/lighten it up but compliment all the wood. White dove and white cloud are on my shortlist. The ceiling is low and the floors are again a honey cork. I’ve poured through every shade of neutral, white, greige… Any input would be appreciated. I have almost the same issue you’re facing! Did you choose white dove? Beautiful pics! We are painting the wood mantel around our fireplace. What finish did you use to paint your mantel? I know semi-gloss is recommended, but we don’t want it too shiny. Yours looks perfect. Thanks. We are thinking Benjamin Moore Chantilly Lace but not sure about the finish. Thanks! Hi Theresa, Our painter used a water-based lacquer custom mixed at Sherwin Williams (sprayed). It’s a beautiful smooth finish that’s not too shiny. For hand application, using pearl or semi-gloss is probably your best bet. 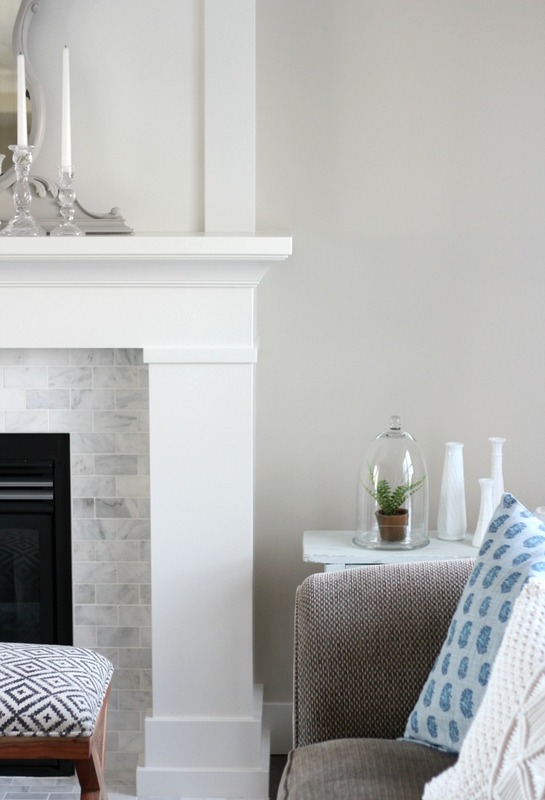 Benjamin Moore has a product called Advance that may be a good option for your mantel. Thank you for your answers as it is so helpful to read all the remarks. My question pertains to a house that has BM China White trim, which I cannot change. We are having the walls repainted and are considering BM White Dove. The wood floors are a medium pecan brown and I assume the ceilings ( will not paint) are also BM China White. What do you think of the BM White Dove for walls? The house has a lot of natural light. Thank you! Thank you!! So gorgeous! The room with the marble subway tile on the fireplace: what is the grey wall color? Hi Karen, It’s Benjamin Moore Baby Fawn. You can see more in this post. Would you recommend this color for an exposed beam wood paneled ceiling? Thinking of painting my bathroom this white dove but scared my wood ceiling will make the bathroom look yellow. 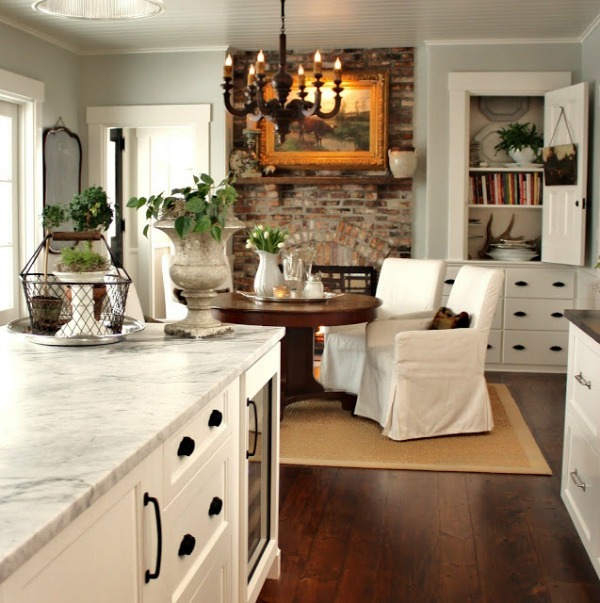 I m doing a full house remodel, and I have selected White Dove for my kitchen cabinets. I was also thinking about doing white dove for all my trim (farmhouse/craftsman style). I have a lot of natural light now that we added more windows. Do you think this is bright enough? I also wanted to paint some of my walls a different white, do you have any recommendations for a white on white look? Hi Kelli, White Dove isn’t a crisp white, so it depends on the look you’re going for. Simply White is a popular choice for something a bit brighter. I would get a sample size and try it out in different rooms (be sure to look at it different times of the day). As far as walls go, we painted some of ours in White Dove eggshell finish with the trim having a bit more of a sheen. If you’re thinking about a different white completely for the walls, I would suggest something with a bit of contrast to the White Dove trim or it could look a bit off. 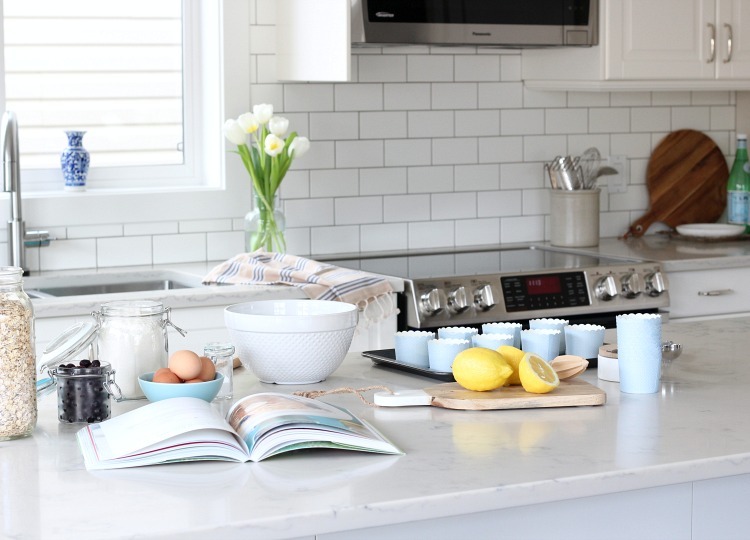 Take a look at Benjamin Moore’s Off-white collection. We did our walls in Baby Fawn which looks nice against White Dove trim. Having a similar undertone is what’s important. What brand light switches /outlets covers do you recommend to match with white dove?